iShopping.pk brings you the best price for Apple Earpods With Remote and Mic (MD827) with express shipping all over Pakistan. 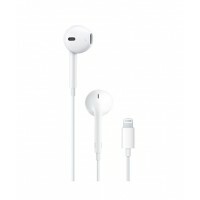 Unlike traditional, circular earbuds, the design of the Apple EarPods is defined by the geometry of the ear. Which makes them more comfortable for more people than any other earbud-style headphone.The speakers inside Apple EarPods have been engineered to minimize sound loss and maximize sound output. So you get high-quality audio that’s just as impressive as what you’d hear from more expensive headphones. The Apple EarPods with Remote and Mic also include a built-in remote that lets you adjust the volume, control the playback of music and video, and answer or end calls with a pinch of the cord.